Ever climbed a steep hill and wondered, “what’s the altitude right now?” Or, “I wonder what elevation level am I at?” Some apps provide your current height quickly and efficiently. Luckily, we rounded up the best ones for your Android smartphone right here in this article. Check out the top elevation app for Android below. By the way, Altitude: vertical distance between an object and the local surface of the Earth. Elevation: vertical distance between the local surface of the Earth and global sea level. The local surface of the Earth will be either land or water surface. We use both terms in the article as some app measure both or do not differentiate between the two. The app has a clean interface and quickly provides elevation data. With a single tap, the globe icon in the lower-left corner and it renders the height that the GPS reads as well as the altitude based on your longitude and latitude. eGPS Elevation even shows how deep is the nearest water area. Find it on the PlayStore. My GPS Altitude and Elevation is an app that displays latitude and longitude as well as altitude according to your device’s satellite GPS receiver. Furthermore, it subtracts elevation from height to render an approximate distance to surface ratio. The application is available for free on Google Play. An Altimeter is an apparatus used for measuring altitude. So, turn your Android phone into an altimeter with the Altimeter app. I know you bit your tongue there. Admit it! An excellent app for people who love hiking, skiing, mountain biking and other outdoor activities. Anytime and with a high precision you can check altitude, elevation or localization coordinates. It works online and offline. See it in action in the below video and find it here. DS Altimeter is an elevation meter, elevation logger, and altitude mapper. In addition to showing and optionally tracking your altitude, the app allows you to search the height for other locations as well. Available for free in the app store. For more altitude Android apps, check out this page. Also, check our recommended Uber replacements, emoji apps, task killers, music player apps and more. We can’t have a list only for Android, right? How about an elevation app for iPhone smartphones? Not to worry, we have you covered with several of the best altitude apps for iPhone. Travel Altimeter Lite displays altitude, latitude, and longitude on the front page of the interface. It has a simple and elegant user interface. Easy to navigate and understand. Also, it provides a quick option to turn on your flashlight. Moreover, there is a paid version that removes ads, allows access to more backgrounds etc. However, the free version provides most of the information you need. My Altitude works without an internet connection. It uses your iPhone’s sensor to provide information on elevation. 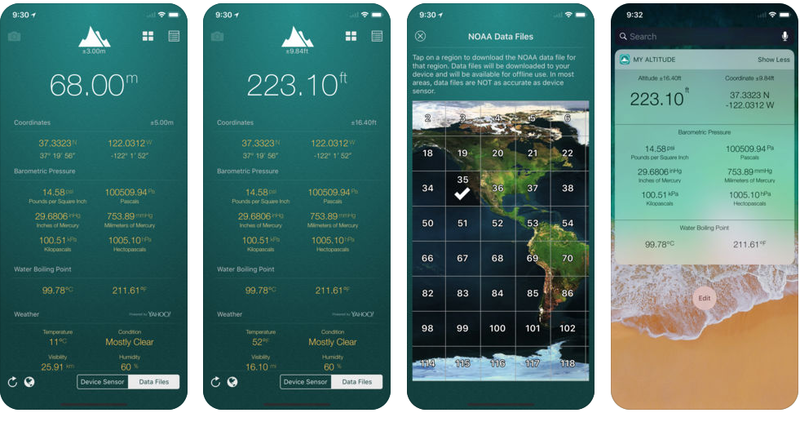 However, you also have the option to manually download additional data from the National Oceanic and Atmospheric Administration. The app allows you to take photos and automatically tags them with location information. Do you like the look and feel of analog barometers? Then, Barometer & Altimeter for iPhone is a good choice to measure your elevation. However, for the app to work, you need an iPhone 6 or above. Why? The app uses the barometric pressure sensor equipped in these models. With the paid version, you get a fishing barometer, two scales on the default barometer, and the ability to export data in CSV format. Are There Good Karaoke Apps For Your iPhone? What Are Good Silk Browser Alternatives For Kindle?